A credit rating agency is a company which rates the debtors on the basis of their ability to pay back the debt in timely manner. They rate large scale borrowers, whether companies or governments. There are three big credit rating agencies in the world which are Standard and Poor’s (S&P), Moody’s and Fitch Ratings. The second credit rating agency incorporated in India was ICRA in 1991.It was set up by leading financial/investment institutions, commercial banks and financial services companies as an independent and professional investment Information and Credit Rating Agency.It is a public limited company.It has its head office in New Delhi.ICRA’s majority shareholder is Moody’s. 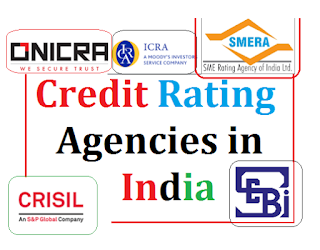 The next credit rating agency to be set up was CARE in 1993.It is the second-largest credit rating agency in India.It has its head office in Mumbai.CARE Ratings is one of the 5 partners of an international rating agency called ARC Ratings. It is a private sector agency set up by Onida Finance.It has its head office in Gurgaon.It provides ratings, risk assessment and analytical solutions to Individuals, MSMEs and Corporates.It is one of only 7 agencies licensed by NSIC(National Small Industries Corporation) to rate SMEs.They have Pan India Presence with offices over 125 locations. Apart from these credit rating agencies, there are three more credit rating agencies which are alsoregistered with SEBI. These are Fitch Ratings India Private Ltd., Brickwork Ratings India Private Limited, SME Rating Agency of India Ltd. (SMERA). 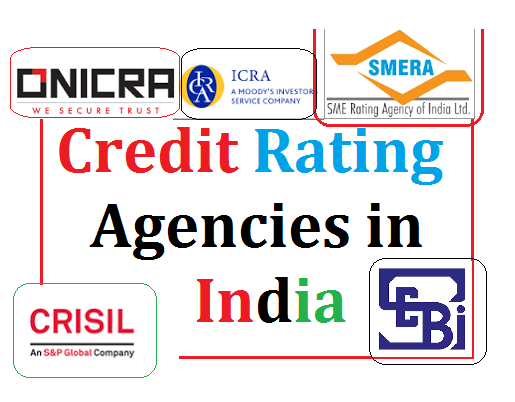 Out of four credit rating agencies, CRISIL, ICRA, CARE and ONICRA, ONICRA is a private sector agency, all others are public sector companies.There are 6 credit rating agencies which are registered with SEBI. These are CRISIL, ICRA, CARE, Fitch India, Brickwork Ratings, and SMERA.